Award-winning, bestselling novelist Gianrico Carofiglio was born in Bari in 1961 and worked for many years as a prosecutor specializing in organized crime. He was appointed advisor of the anti-Mafia committee in the Italian parliament in 2007 and served as a senator from 2008-2013. 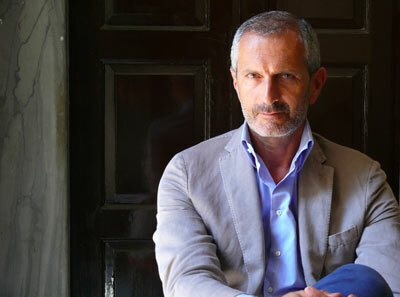 Carofiglio is best known for the Guido Guerrieri crime series: Involuntary Witness, A Walk in the Dark, Reasonable Doubts, Temporary Perfections and now A Fine Line, all published in English by Bitter Lemon Press. His other novels include The Silence of the Wave. Ayo: A Fine Line is as much about ethics, the Italian Judiciary and human behaviour. What was the impetus for the storyline? GC: Let's say that the answer is already in the question. I wanted to talk about the contrast between ethics and human behaviour in the judiciary. And of course I wanted to do that in a non-patronizing way, with suspense, and characters you can love and hate. Moral balance plays a big part in A Fine Line. How easy is it to define and to have that moral compass? How much did your job as a judge have an influence on your writing? Having been a judge and a prosecutor for a long time is, of course, important if you write crime stories and courtroom dramas. Not only for the obvious reason that if you want to write about lawyers, prosecutors, judges and criminals without sounding ridiculous, you must know how things are in a law court. There is another, less obvious reason. Being a prosecutor, a defence attorney or a judge puts you in touch with a world of characters and stories that are the fuel for good fiction. A Fine Line is the fifth book to feature Guido Guerrieri and, as much as he is a fine lawyer, his personal life leaves a lot to be desired. At least he is not drinking as much and is eating better. But where does he fit in the annals of characters? On the one hand he seems to be an anti-hero or does one see him as a modern hero? There is a definition about Guido Guerrieri that I like very much: he is a ‘reluctant hero’. How much has Guido Guerrieri changed since Involuntary Witness? Maybe he is more aware now, more able to listen to others. What has not changed is his sense of humour and his self-deprecating attitude. This is something very useful (if you don't exaggerate and become self destructive) in order to keep your personal, psychological balance. Where did the character of Judge Larocca come from, and is he based on anyone that you know? Let me say that this is not a true crime book. The characters and the story are fictional. But somehow Judge Larocca incarnates a certain attitude of some powerful people. The idea that the rules are for the others, not for them. Is A Fine Line, for you, a look inside the Italian judiciary? I wouldn't say so. Of course everything is perfectly realistic (even if totally fictional) but I didn't want to talk about the Italian Judiciary. I wanted to talk about human nature. After writing A Fine Line is there is anything about the Italian judiciary that you would change if you could? There are many things that I would change about the Italian Judiciary. If I had to say just one I would say: the duration of trials (except for the ones concerning organized crime) are in general really too long and slow. How difficult is it to keep a series fresh? Your novels explore not only criminality but also, its effect on those who pursue it. Has life been imitating art in your books? Difficult question. Maybe. For sure there are several bi-directional connections. How close are you own personal views to the struggle that whether or not those who come into contact with evil can remain undefiled? You can remain undefiled only if you don't think that you are immune from evil and corruption. You must be aware of your weakness and you need a moral compass constantly working. Are you a fan of legal thrillers yourself and if so which are your favourites and why? I am a fan of some (very few) good legal thrillers and my favourite is Presumed Innocent by Scott Turow. It is very good fiction written by a guy that for sure knew what he was talking about. What next for Guido Guerrieri? Thank you for taking the time to talk to SHOTS.